For the Shrimp: Preheat a grill or grillpan over medium-high heat. In a large bowl, whisk together the lime zest, lime juice, vegetable oil, sesame oil, and a generous pinch of salt. Add the shrimp and toss to coat. Grill the shrimp for 1 1/2 to 2 minutes per side, or until opaque. For the Shrimp Dressing: In a large bowl, combine the ginger, sambal, sesame oil, sweet soy sauce, fish sauce, lime juice, thai basil, cilantro, and whisk together. Toss the cooked shrimp in the dressing. For the Noodles: Whisk together the honey, soy sauce, and extra virgin olive oil. Toss the carrots, scallions, and noodles in the dressing. Season with salt. For the Peanut Relish: Combine the peanuts, serrano peppers, mint, and salt in a mortar and pestle and crush into a coarse relish. Or combine in a food processor and pulse. 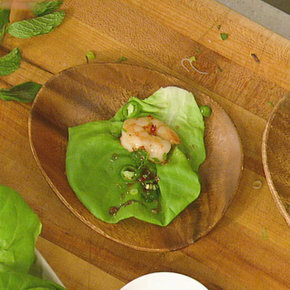 For Serving: Serve the dressed shrimp and dressed noodles with a platter of the butter lettuce leaves, mint, basil, and cilantro. Assemble as desired and garnish to taste. 1. 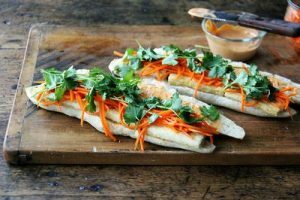 Be careful with the fermented fish sauce, too much ruins a dish! 2. Customize your lettuce cup with the garnishes of your choice.